Have a question on Q3? Q3 is available in 11 different colors - Glacier White Metallic, Brilliant Black, Daytona Grey Pearl Effect, Cuvee Silver Metallic, Monsoon Grey Metallic, Floret Silver Metallic, Utopia Blue, Misano Red Pearl Effect, Mythos Black Metallic, Tundra Brown and Cortina White. Watch latest video reviews of Audi Q3 to know about its interiors, exteriors, performance, mileage and more. The Audi Q3 was introduced in year 2011 as the smallest crossover from the Audi's bench. The car has a smart design which is inspired from the elder SUV siblings of the company. As the Audi is governed by the Volkswagen Group, The Q3 shares its platform with the VW Golf and VW Tiguan. The exterior appeal of this car is designed to match with the standards of the company and its face is crafted well to match with that of other Audi cars in the lineup. Inside the cabin area, the quality of material is kept top notch, and it delivers a certain confidence while using them. The high sitting posture of the car informs you off a SUV-ish styling, however, the seats don't lose over the comfort level. The engines under the hood are well mated to perform over the rough and plane roads. The cabin has a lot of quality perspectives; it is loaded with the equipments which are a must in this segment. The dashboard material quality is great and it is rigid in feel. The steering is wrapped in soft leather while the complete upholstery is worth appreciating. As this is the smallest car in the company's SUV range and it doesn't offer the performance dynamics which every other car from the house is supposed to do, their is hardly anything which lags behind in the character demand. The audio system sits in a small gap carved in the dashboard while the air conditioning vents are surrounded with chrome inserts. The top end spec also comes with a dash board mounted screen which is effected with navigation controls. As far as the seat comfort is concerned, there is ample room at all seats but taller people will find difficulties. At the trunk, the 460-liters of boot space gets expanded to 1365 liters with seats being folded. One of the smartest appearance is seen in the the Audi Q3; it is a full fledged car with good SUV character, still it looks small against the competition. The outer body shell of the Q3 are well managed by the manufacturer and thy have ended up giving it a compact nature despite a comfortable ride. The dimensions of the this car measures 4385 mm of length, 1831 mm of width, 1608 mm of height and 2603 mm of wheelbase. The 17-inch alloy rims coats up 235/55 R17 size tyre. Dimension wise, the Q3 is way smaller than the BMW X1 and with this reason, the Audi's player falls short over the clash. The United Arab Emirates received three variants among the engine options. The 1.4-liter 4 cylinder in-line petrol turbocharged engine is the least powerful one which develops 150 hp of power at 5000 to 6000 rpm along with 250 Nm of torque at 1750 to 3000 rpm. Audi Q3 also sports a 2.0-liter 4 cylinder in-line petrol turbocharged engine which churns out 170 hp of power at 4300 to 6200 rpm. The torque associated to the same is 280 Nm at 1700 to 4200 rpm. The third engine is a 2.0 liter motor with better power output of 211 hp at 5000 to 6200 rpm with related torque output of 300 Nm at 1800 to 4900 rpm. The top speed of all these engines ranges between 200 kmph to 230 kmph while the zero to 100 kmph acceleration counts between 8.9 seconds to 6.9 seconds. The fuel efficiency receivable also slides between 12 kmpl to 15 kmpl gap. Handling and stability of this car are great and it moves smoothly around the corners. The steering is a bit low on response which is hurdle while driving in city limits and getting fun out of the machine. Also, unlike Q5, there is no adjustable dampers in the Q3; this brings it to a stiffer ride over the bad roads which is not a good thing. Although, the structure of the car is made of best quality material and this adds protection during any collision or soar happening. The disk brakes, anti lock braking system, electronic brake force distribution, traction control, multiple airbags and brake assist comes as standard fitting. The Audi Q3 is a capable SUV and has a good road presence. Their are few things which make it look down including the lack of head room, stiffer ride and low responsive steering. Still, it brings to us a good package for a budget-luxury car buyer which makes a lot of sense over the other players. What is the price of Audi Q3? 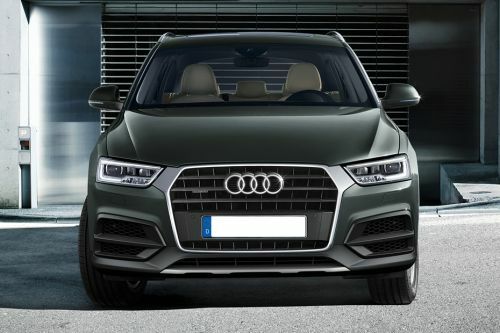 On road prices of Audi Q3 in starts from AED168,000 for base variant 35 TFSI Design quattro (180 HP), while the top spec variant 40 TFSI Design quattro (220 HP) costs at AED177,000 . What are the colors options available in Audi Q3?